KISS founding member Paul Stanley has accused the Rock and Roll Hall of Fame of giving other bands preferential treatment when deciding who can be inducted. It comes after Stanley and bandmate Gene Simmons learned that longtime members Eric Singer and Tommy Thayer would not be honoured by the hall because they were not part of the original line-up. 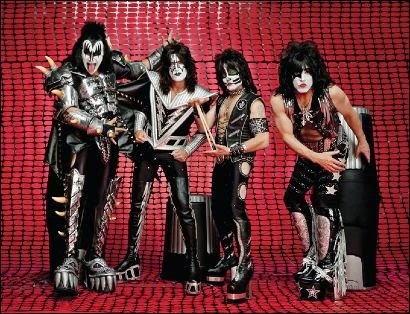 As a result, KISS has turned down an invitation to perform at their own induction ceremony in April. Stanley and Simmons have pointed out to Hall of Fame Foundation CEO Joel Peresman that founding members Ace Frehley and Peter Criss were only in the band for the first seven years, whereas current members Singer and Thayer have played with KISS for 20 years. Stanley on Thursday wrote an open letter to Peresman in which he accuses the foundation of favouritism. He cites their 1994 decision to let rock band Grateful Dead induct 12 members from an ever-changing line-up, including behind-the-scenes songwriter Robert Hunter. "The Rock And Roll Hall Of Fame continues to attempt to restore its questionable credibility and glimpses behind the facade with nonsense and half truths," the singer says in the letter posted on the KISS website. "The truth is Joel Peresman and the rest of the decision makers refused to consider the induction of any former KISS members and specifically the late Eric Carr and Bruce Kulick who were both in the band through multi-platinum albums and worldwide tours and didn't wear make-up. Stanley said the preferential treatment of the Grateful Dead went so far that they were given the power to choose how many members they wanted to be inducted. They even allowed their request to include a songwriter who had never been a Grateful Dead member, he said. "There is no getting around the reality ... (of) the Hall Of Fame's favouritism and preferential treatment towards artists they like," he said. The singer said the Hall should "just accept the truth as it is and move on" rather than try to explain its reasons.